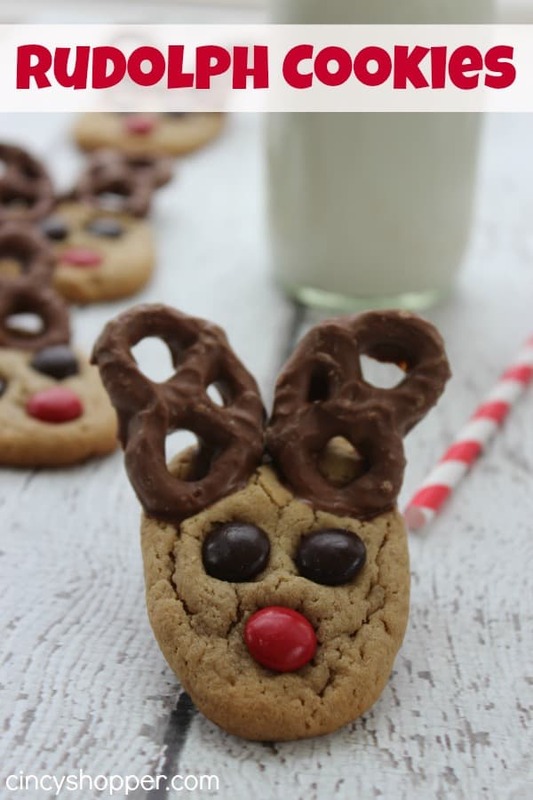 If you are looking for a quick and adorable cookie to make consider making these Rudolph Cookies. These cookies are a hit with adults and kiddos. My kiddos just came home from school and consumed almost all of the dozen I made today, ha ha! I just tossed a few more in the oven to have for my cookie tray I wanted to have to offer guests for later in the week. 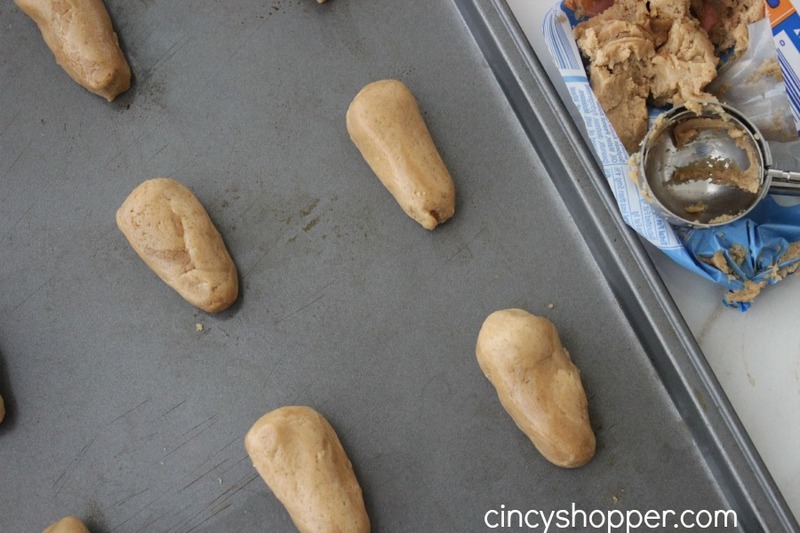 I tried a few different Peanut Butter dough recipes, trying to get one that would not flatten out and would keep its shape. I had no luck so I decided to snag a roll of Pillsbury Cookie Dough while at the grocery last night. This dough worked perfect. No more fighting with finding the perfect dough. I will admit that was the most frustrating part of these cookies. 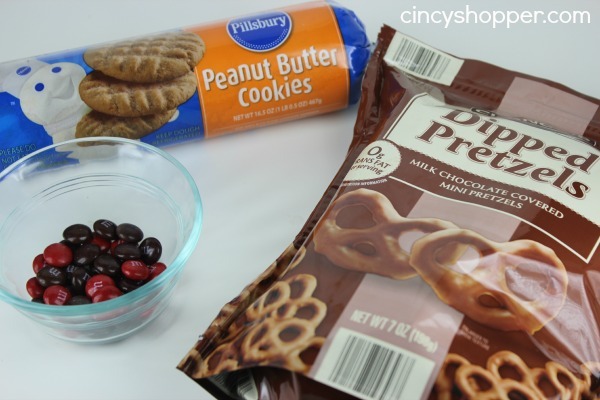 Snag some Pillsbury Peanut Butter Cookie Dough, some of those M&M candies we have scored on the cheap and some chocolate covered pretzels and you too can have these adorable Rudolph Cookies, ha ha! 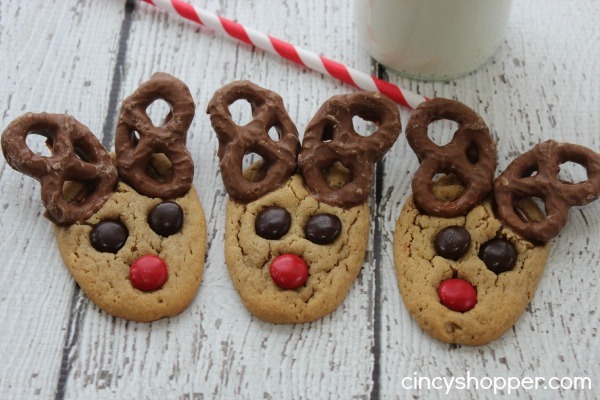 These Reindeer Cookies would be great for the kiddos to take to school too! Scoop about 1 tablespoon size balls of dough. Roll in your hands into a more elongated tapered shape (see pic). Bake for about 10 minutes until edges just start to get brown. Remove from oven and allow to cool on cookie sheet for just 1-2 minutes. 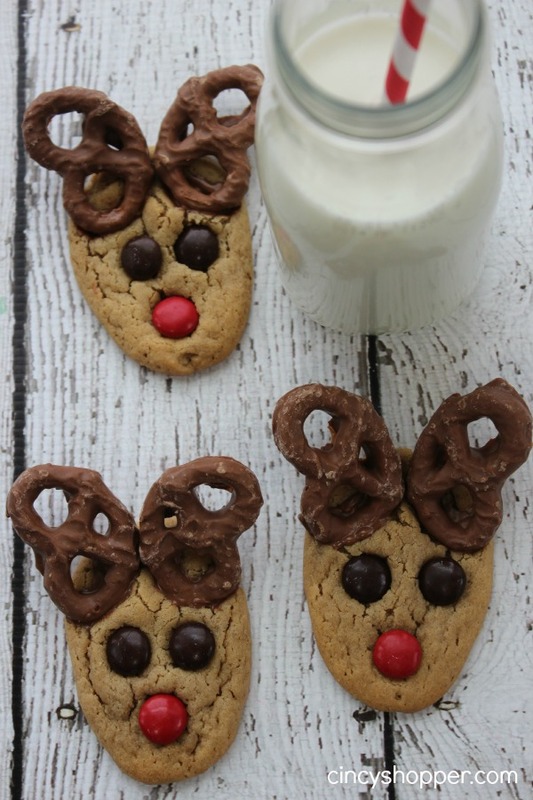 While cookies are still warm, press in 2 pretzels for antlers, 2 brown M&M’s for eyes and 1 red M&M for nose. MOVE QUICKLY! I would suggest doing these 6 at a Time. You need to do this on all cookies quickly in order for the items to stick. If they don’t stick after setting, you can melt chocolate to use as “glue” to fix any loose pieces. Place in refrigerator or freezer to get the pieces to set up. I have mentioned many of times how much I love cookies during the holidays. I am hoping to sneak one of these lil guys tonight with my evening coffee. Peanut Butter cookies are definitely one of my favorites. Do you have a favorite cookie you make up for the holiday season? Looking for other holiday cookies and treats? If so, be sure to check out all the Holiday Creations I have shared with you here.